It has been All Things Elsa up in this house lately! If you follow me on Facebook you’re familiar with The Great Elsa Halloween Debacle of 2014, which has since led to a regular discussion on how many days in a row you can wear the same pair of pajamas. She is refusing to have her hair cut until she has a long braid like Elsa. She literally wakes up in the morning singing “Let it Go!” at the top of her lungs. Oh, I could go all day. Shortly after I started making handmade ornaments for this 12 Days of Christmas series I got the idea of surprising Kate with a super special ornament just for her, and I knew she’d go nuts if I could somehow figure out how to make an Elsa ornament. I originally thought of doing something with Elsa stickers, but then I found a package of Frozen tattoos at Target’s Dollar Spot and decided to give them a try. Did you know you can tattoo glass?? Neither did I – until I did it! To make, I used a plain glass flattened circle ornament from Michael’s and placed the cut out Princess Elsa tattoo face down on the glass. I then covered it with a wet rag to transfer the tattoo to the glass. I used a q-tip dipped in rubbing alcohol to clean up any excess clear tattoo material around the outside of Elsa’s body and then filled the ornament with faux snow (of course!) to really make Elsa pop. To finish it off I added some sparkly snowflake stickers and gems, and a ribbon for hanging. Kate loved her Princess Elsa Ornament so much she gasped in awe the first time she saw it. Totally worth having to hear “Let It Go” for a little bit longer. Like this project? Check out the rest of my DIY Frozen Ornaments! 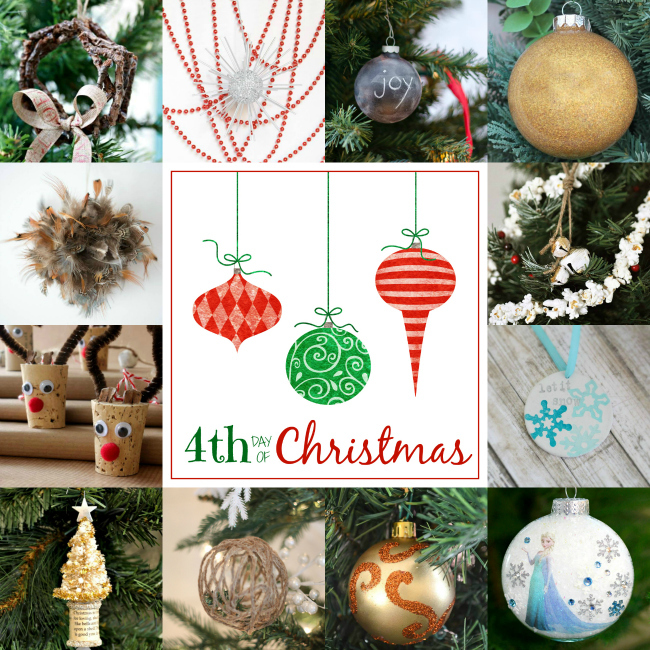 Here are the rest of our handmade ornaments for Day 4 of our 12 Days of Handmade Christmas Ornaments – click around and enjoy! Catch up on my DIY ornaments so far at the links below! Four handmade ornaments down – 8 more to go! Thank you so much, Linda! I was so surprised, too! I was holding my breath as I peeled that paper backing off just hoping it would work and it did – woohoo!! YOur “Elsa” ornament is one of the most beautiful ideas I’ve seen so far. Every little girls dream. What a wonderful compliment! Thank you so much, Trish! Add it to the list, Ashley, haha! This is going to be such a hit with my friends’kids who are Frozen obsessed! Thank you, Vidya – ours too! Love love this idea. Just made 4 of these! Thank you so much for this adorable idea! I LOVE hearing that – thank you so much, Stephanie! So happy you decided to give these a try! Thank you, Kristant! I’m sure you could if you could get your tattoo (and a wet rag) in there. The tattoos are surprisingly durable. Kate has been carrying this ornament and her Princess Anna ornament everywhere she goes and they’re still in perfect condition. Where do you buy the tattoo? I have all the other supplies on hand. It is so cute and I know my great g/daughter will love it. Thank you so much, Marilyn! I purchased the tattoos at Target – in their dollar section. Love this, I made a few but am worried about the tattoo coming off if it’s not sealed? Has anyone tried to spray anything over the ornament? Thank you, Liz! Kate has been carrying her ornaments all over the house and they haven’t so much as scratched so I think they should be good, but if you want extra protection I’m sure you can lightly coat the top with a clear finish like Mod Podge or a super light coat of clear spray paint. Word of warning, the Frozen Tattos from the party section in a Target (pack of 50) do NOT work very well!! The dollar section tattoos work so well! I’m not sure what the difference is?! Hi Liz, thanks so much for the tip! The only tattoos our Target had were the ones in their dollar section and that’s what we used. They worked great! Love this idea but couldn’t find the tattoos at my target so ordered online and they won’t stick to the glass, they just peel right off! Did I buy the wrong ones or do something wrong?? Hi Melanie! So sorry to hear the tattoos you got didn’t work! The kind I used were not peel-off. They were the kind that you need to put over skin (or in this case, glass) and put a wet cloth over for a minute to get them to transfer/stick. Hope that helps, and good luck! Love Love love this!!!! Saw your idea yesterday….bought the supplies and making them with my nieces today!!!!! What a hit! should I spray with a sealer or would that ruin the tattoo? Oh how fun, Stacey! I hope your nieces loved the project and they turned out well. I’ve found there is no need to spray the ornaments with anything to protect them, but I suppose you could do a coat of clear spray paint or Mod Podge if you wanted to. Oh that’s hysterical, Fawn, lol! Love that! Sure, Susan! The shape of the glass ornament isn’t a round ball – it looks more like a flattened ball. So the front and back of it has a flat surface which makes it perfect for transferring a picture to it. After I transferred the tattoos to the glass, I removed the little silver hook thing at the top (which reveals a circle opening to the inside of the ornament) and filled the inside of the ornament with faux snow. Hope that helps! Will this work on a plastic surface? I’m actually not sure, Rachel. Has anyone tried this with plastic? So happy to hear it, Katy! Thank you so much, Carin! I am not near a Target store. Anyone know if the Dollar Store or Walmart have the tattoos? I’m not sure, Karol, but its certainly worth a try to look. Maybe also online? Amazon? Party City? I did it with the plastic version, and it did work!! I also tried this with the Target dollar section stickers, and the tattoos work far better. The stickers kind of crease up a bit. So great to hear feedback regarding the plastic ornaments – thank you, Colleen! I’ve also tried using stickers to make Kate a Disney princess ornament and it didn’t turn out so well. Tattoos are definitely the way to go! Does anyone know where I can get this sticker. I have tried several Target stores and no luck. Hi Darlene – I’ve found that stickers do not work as well, so I recommend looking for Frozen tattoos. You can continue checking Target as I’ve noticed sometimes they are out of stock, but they do restock. Online may be another option (Amazon? Ebay?) and maybe Party City? Good luck! Oh, I LOVE this!!!! I can’t wait to make these with y granddaughters! Thank you for sharing such a beautiful .. and simple!… craft. My pleasure, Carol – thank you so much! Need help….I bought the tattoo’s from the $1 bin from Target and I’m using glass ornaments, I can’t the tattoo to transfer. How along did you leave the wet rag on? I left the rag on for about a minute. I made sure it was pretty wet – not dripping, but also not well rung out – to do the transfer. I hope you’re able to make yours work! I didn’t find the tattoos at Walmart either but Amazon does have them. I’m going to try a plastic ball ornament, I’ll keep u posted on whether or not it works. Any chance you have any other ornaments made with the rest of the characters I could see for visual? Like Anna, olaf, Sven? This ornament is great I love it. Thank you, Amy! And I do have additional Frozen ornaments! I also have a Princess Anna ornament and an Olaf Ornament. I’ve linked them up in the post above. Enjoy! This works on plastic as well as completely round ornaments. Just be careful. Thank you so much for the feedback, Jocelyn! So do these work on the plastic ornaments? I have not tried this on plastic, but a couple of readers have and have reported that it works great! I love this idea!!!! My youngest daughter loves Frozen we even had a Frozen Birthday party for her. I want to do these next Christmas! but I have two toddlers and prefer not to use glass ornaments I found this out 10 years ago with my oldest daughter who is now 14 that glass isn’t a great idea couldn’t get her to leave the ornaments alone until they were broke. So I’m gonna try it with plastic, and hope for the best. Thanks you for the wonderful idea!. Also what is the brand of fake snow you used I’ve seen so many not sure which would look most realistic inside of an ornament. Oh gosh, I’m really not sure. I bought it at Michael’s, but I do think anything will work. I actually just used white cotton stuffing (like pillow fill) for the Olaf ornament I made and that looks great as well! It sounds like it works great with plastic too, Jennifer, so you should be in luck! I’m currently in the middle of decorating our home for a Frozen 5th birthday party for my little girl. She’s obsessed as well! Pics of her party will hopefully be posted next week, so please check back if you’re interested. Good luck with your ornament! Can you tell me where to find the snowflakes used on Olaf’s ornament. I love the look of them. Thank you, Deb! That is just the faux snow you can purchase by the bag from a craft store. I believe I got mine at Michaels. Hope that helps!